Quad biking is a great way to enjoy the outdoors with your friends or family and offers an exhilarating but relaxing experience through some of the most scenic areas that the Overberg has to offer. 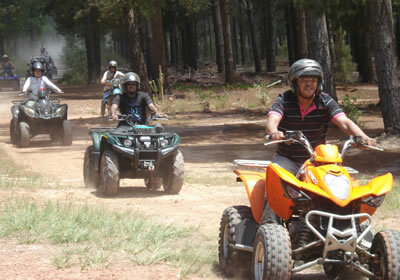 Our quad biking trails are operated in the Helderberg, Hermanus and Caledon areas. All the trails are guided and controlled. We have stringent safety measures in place. No previous experience is required, making this an accessible activity for all nature lovers. This is a true eco adventure with the accent of our trails on the nature experience. All our trails operate with a limited number of riders making the experience more select and pleasurable. -Suitable for all outdoor enthusiasts -Beginners are welcome and we will provide tuition before the ride -Fully automatic quad bikes are used -Stringent insurance regulations are applicable to lifting passengers on quads. Guided excursion with refreshments en route, entrance fees, quads and safety gear for quads. Lunch except if specified, personal expenses, gratuities. -All services are subject to availability at time of booking. -Prices are quoted on a per person basis, inclusive of VAT. -Minimum 2, 3 or 4 pax per booking depending on excursion selected.